Download our SAFE Toolkit App! Use Safer (Smarter) Pilot Tools; Always Learning! ForeFlight, Pilot Workshops Series, Modern Pilot subscription; become a safer (smarter) pilot! As a flight instructor for many years, I am always amazed at the reluctance of pilots to spend money on proven, beneficial training. This is true in the flight arena but even true for ground training where the relative costs are almost insignificant. A new camera or GPS is easily justified (let’s not talk about all the other pilot bling) but a training course on-line or EFB subscription is often ruled “too expensive” and avoided due to cost! This is one reason SAFE is always pursuing new discount opportunities for our members. The training and courses you see discounted on our website can really help you achieve a greater comfort and safety level in your flying (and these tools are excellent for teaching sessions too). Building knowledge in your non-flying hours is always cheaper than burning avgas! Here are a few ideas and especially for SAFE members…incredible bargains. Free to everyone, and especially useful for CFIs is our SAFE Toolkit. This app provides every instructor all the FAA required AC 61.65F endorsements and hour requirements for preparing and recommending students for flight tests. (Every DPE will be impressed with your comprehensive and accurate prep work!) And for any pilot, this App also provides amazing mobile weather and flight tracking all in one place. Also free is the Pilot Workshops series: IFR Focus This easily-accessible, simple training is just a hint of what is available with a full Pilot Workshops membership (see SAFE discounts below). The subtle differences in the ILS lighting arrangements on lower than 3 degree ILS glide path now make good sense; further from the runway! The Pilot Workshops training will help make you a true professional and fill in those knowledge gaps that develop with new technology and the erosion of proficiency that is inevitable with the passage of time. To be safe in flight you need to continue to train and pursue excellence. This series of on-line courses and technology tools are super helpful in this mission. Not free, but worth every penny is the well known ForeFlight App. Though a proven safety tool, I unfortunately see people struggling with less comprehensive and efficient technology (or out dated maps) due to the pricing penalty of new technology. SAFE provides 1/3 off your ForeFlight subscription. This benefit essentially provides ForeFlight users a free SAFE membership (and you can buy a Starbucks with the difference)! There is no reason *not* to have ForeFlight. And though ForeFlight is very intuitive, I continually discover new and helpful features that good ground training can more easily reveal. 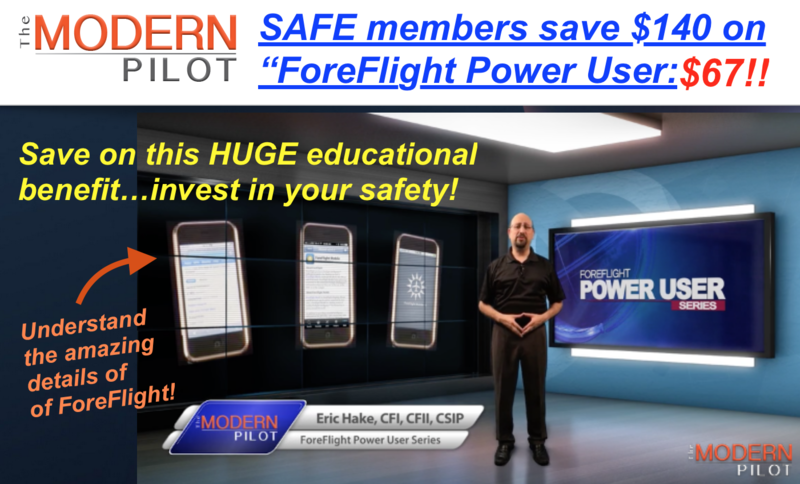 SAFE provides a huge discount to ForeFlight Power User created by The Modern Pilot. Eric was ForeFlight employee #1 and the primary “ForeFlight evangelist” for years with the company before creating this educational series for pilots. For only $67 you get a full course and ongoing subscription to The Modern Pilot. Aerovie is another comprehensive Electronic Flight Bag (and is available free to all SAFE members). When you try this system you will see a different philosophy at work and a robust integration with the actual FAA weather website in a very clever system. The Aerovie enroute weather presentation is amazing. This adds greatly to your view of the changing environment and consequently improves your flight safety. For SAFE members, Pilot Workshops waives the $199 new member fee and their monthly member fee is reduced to only $19. That is so reasonable that no conscientious pilot could ignore this opportunity. Sportys, ASA and King Schools all offer a 20% discount to SAFE members. As mentioned, ForeFlight offers SAFE members 1/3 off and Aerovie is completely free to members. If you are a CFI you can offer a substantial discount to your students to motivate and encourage their progress. There are many more discounts and promotions on the member discount page. Please get on board by joining SAFE and enjoy these amazing sponsor discounts! Please “follow” our SAFE blog to receive notification of new articles. Write us a comment if you see a problem or want to contribute an article. We are always seeking more input on aviation improvements and flight safety. There are many highly qualified aviation educators out there! If you are not yet a SAFE member, please Join SAFE and support our mission of generating aviation excellence in teaching and flying. Our amazing member benefits alone make this commitment worthwhile and fun. Lastly, use our FREE SAFE Toolkit App to put pilot endorsements and experience requirements right on your smart phone and facilitate CFI+DPE teamwork. Working together we make safer pilots! SAFE CFI-PRO™ Released @ SnF! Aviation Ideas and Discussion! Powered by WordPress.com.